After twenty years of painting the portraits of Scottish worthies, Henderson discovered his true vocation in his forties, as a painter of marine and coastal scenes. He continued to produce portraits of local dignitaries, such as James Paton (1897), one of the founders of the Kelvingrove Art Gallery & Museum, and Alexander Duncan, secretary & librarian of the Faculty of Physicians & Surgeons of Glasgow; but as he painted the sea his style changed, becoming more colourful, spontaneous and impressionistic. 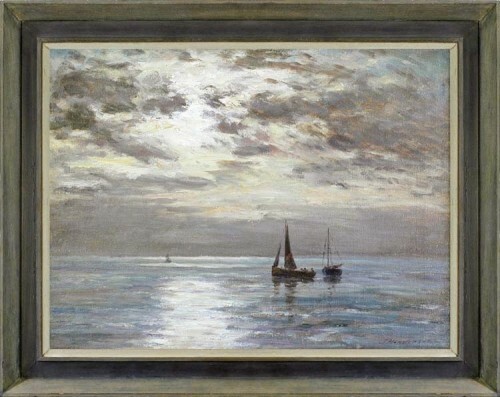 This particular work displays his bravura handling of clouds and weather effects, and his ability to depict the sea under the changing light. Joseph Henderson (1832-1908) was born in Perthshire; he lost his father, a stone carver, at the age of 11 and was apprenticed to an Edinburgh draper, but was allowed to study part-time at Edinburgh’s major art school, the Trustee’s Academy. He studied under Robert Scott Lauder, and among his contemporaries was William Quiller Orchardson, with whom he visited the 1851 Great Exhibition in London, one of the most important artistic events in his life. His self-portrait was accepted by the Royal Scottish academy, and – aged twenty – he gave up the drapery trade for portrait painting. He also painted landscapes, seascapes, coastal and genre scenes. He exhibited at the Royal Academy (between1871-86), the Royal Institute of Painters in Water Colours, Society of British Artists, Glasgow Institute of Fine Arts, Royal Scottish Academy, Royal Scottish Society of Painters in Watercolours, Walker Art Gallery in Liverpool and Manchester City Art Gallery. In 1878 he became an associate of the Royal Scottish Society of Painters in Water Colours, and in 1906 a full member. His three sons all became artists, John being appointed director of the Glasgow School of Art; his daughter Marjory married William McTaggart. Works in public collections include Lancaster City Museum & Art Gallery, and Smith Art Gallery & Museum, Stirling.